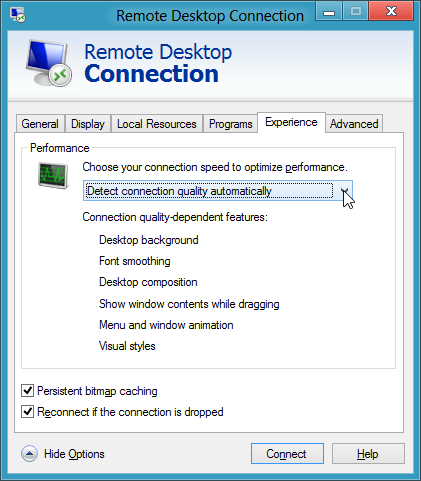 One of the coolest "little secret” features that has been in Windows since XP has been the ability for the RDP client to “smart size” or Scale the contents of the Remote Desktop to fit the boundary of the window as you drag the boarders around. The problem is that there was no exposure in the client settings interface to turn it on. So if you didn’t know it existed, you had no chance to discover it until you met someone like me who might have told you... Well that’s about to change in Windows 8. The next time you used that RDP file you could drag the boarders of the remote desktop and it would automatically scale to fit as you resized it. Pretty cool stuff, but it required you to disconnect and reconnect if you wanted to change that property. Read about it on the Terminal Server blog form 2008. If you have taken the plunge and installed the Windows 8 Release Preview when you launch Remote Desktop you’ll get the traditional Windows MSTSC.exe client. The Metro Remote Desktop application that was in the Developer Preview and Computer Preview has been removed from the start menu and is now available from the Productivity section of the Store. You’ll also notice that the Settings GUI hasn’t changed almost at all with the exception of the Experience tab which now has the option to “Detect connection quality automatically” as the new default. 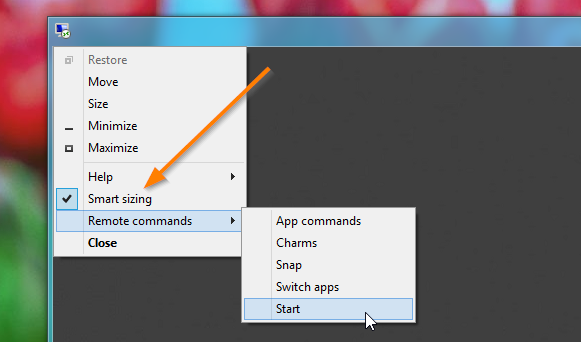 Once you have connected to a Remote Desktop, you can click the Icon in the Title Bar and you’ll discover a new option: Smart sizing!! Clicking that will flip between a “static resolution” and dynamically fit to the window, on-the-fly! I have been asking for this for a long time and I am thrilled to see it! There’s also some more options available when connected to Windows 8 or Windows Server 2012 endpoints which give you clickable access to some of the Metro components like the Start menu and Charms bar. Anyway, I just thought those were some great little touches that have been added in RDP8.